Mivoc modules are characterised by their sheer unbelievable low prices. There is no competition for the AM 120 in its performance bracket. In return you might have to experiment with the running of cable to avoid hum (85% of all hum problems are caused by incorrect cabling). 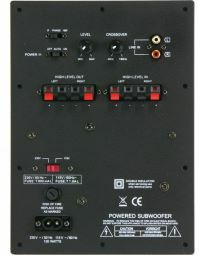 Subwoofer module with gain control, cut-off frequency control and phase inversion switch. RCA sockets (to connect to pre-amp out) and binding posts (to connect to the main amp) are available. The satellites maybe looped through the module. Outside dimensions (HxW): 249 x 180 mm, required cut-out (HxWxD): 220 x 150 x 90 mm.